If you don’t know which are the most expensive Piaget watches, Ealuxe gives you a helping hand! You all heard of the Swiss company Piaget. In 1874, Georges Edouard Piaget established a workshop in La Cote aux Fees. Later, it became a larger company. But today it is one of the most prestigious jewelry brand in the world, as well as one of the most expensive ones. And we have an article to prove that. Without no further talking, let’s get straight to business and see which are the costliest wristwatches by Piaget. We start our top 10 list with this gorgeous item. 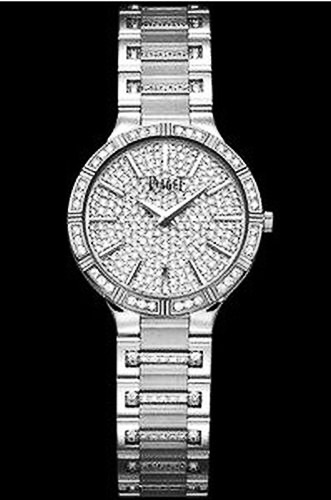 Piaget Dancer Large White Gold Pave Diamond watch features a diamond dial, a bezel also made of diamonds, as well as a bracelet made of white gold, which weighs 18 karats. Not to mention, the bracelet is also encrusted with diamonds and has a hidden folding clasp. Worth $87.000, this watch measures 38 millimeters in diameter and 4.2 millimeters in thickness. And if you think this is expensive, wait until you see our #1.